Honor Play will be first to deliver the phenomenally fast mobile gaming and entertainment experience that gamers have always wanted. BERLIN, Aug. 30, 2018 /PRNewswire/ — Honor launched the Honor Play today, the first of a game changing new product series to deliver the revolutionary fast gaming and entertainment experience the global gaming industry has been waiting for. The Honor Play is a performance beast with the groundbreaking graphics processing technology GPU Turbo to meet young gamers’ demands for “lightning fast” graphics processing capability and extended battery life. Completing the Honor portfolio strategy, the Honor Play offers young people what they really want from their smartphone, an immersive non-stop gaming and entertainment experience. Until now, however, this experience has been plagued by space and capacity problems, thermal efficiency and battery consumption issues because of the popularity of tactical tournament games, and because AR, VR and HDR rendering rely on fast graphic processing power. Working with PUBG MOBILE, which is one of the most popular tactical tournament games, Honor took every effort to not only solve these performance problems but develop the first-ever gamer-oriented phone, the Honor Play – a “Game On” moment for the industry because it will redefine the mobile gaming user experience at an affordable price point of €329. 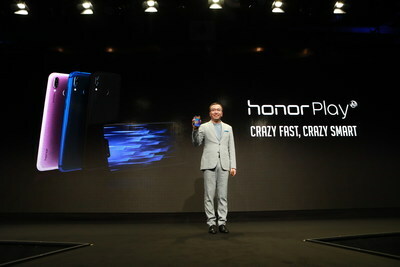 The Honor Play offers an unprecedented gaming performance and a 24/7 “Always On” entertainment experience. This launch brings two ground-breaking and industry leading smartphone technologies to gamers and casual users. The first is Honor’s new GPU Turbo, which dramatically increases the graphics processing and computing efficiency, and the other is Honor’s advanced AI technology, which revolutionizes the smartphone camera function. The GPU Turbo is an innovative hardware-software integration solution that leaves Honor’s competitors trailing in the dust. As the global strategic partner of PUBG MOBILE, Honor Play has dramatically increased the graphics processing and boosted the average frame rate to 39.46 on PUBG MOBILE. The jitter rate has been reduced to 0.21%, more than a full percentage point below Honor’s key rivals, and the battery life has a 30-minute lead over other flagship devices with 4.5 hours of solid gameplay. The Honor Play in-game experience has been AI-enabled for total immersion. The 4D gaming experience includes 3D audio effects and AI vibration customized for the most popular mobile games and matched to in-game objects and scenarios. AI 4D Smart Shock can be enabled for 30 different scenario vibrations, according to the direction of approaching enemies or gunfire. This is complemented by the 3D surround sound by Histen 3D audio technology, an ultra-wide 3D sound field that immerses the player in a cinematic audio experience. The Honor Play is one of the smartest mid-range phones on the market. With AI motion detection and intelligent recognition, snapshots using the 16MP front camera are now easier than ever before. Casual users will experience just as much fun from this device as gamers, thanks to the huge 3,750 mAh battery which allows for heavy gaming and entertainment use, equaling more than 15 hours of video streaming and 95 hours for music playback, even with the 6.3-inch Honor FullView FHD+ display. A range of smart features are enabled by the Kirin 970 NPU chipset which, together with EMUI 8.2, unleashes a truly AI-mazing processing power. The slim and subtle unibody metal design comes in a range of colors for all gamers: Midnight Black, Navy Blue, Ultra-Violet, and a special Player Edition patterned in red and black. The design retains the body of a typical 5.5-inch screen device to ensure it fits comfortably in your hand and packs a 19.5:9 bezel-less display. 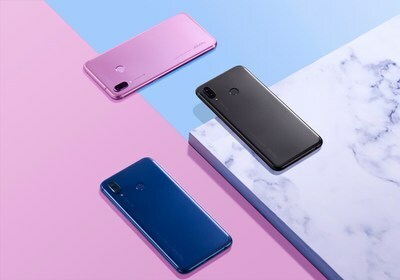 The Honor Play will be available at of €329 for purchase at HiHonor.com in global markets including Western Europe (UK, France, Germany, Italy and Spain), CEE & Nordic, Middle East, Russia, India and Asia Pacific. Honor Play fans will have the opportunity to put their skills to the test and compete with and against the world’s star gamers at Gamescom this year, on PUBG MOBILE and Asphalt 9. Both games have been customized for the Honor Play, with many others due to be announced shortly. Sharing the same passion for speed and performance, Honor, the smartphone e-brand is working with Audi to celebrate the arrival of Honor Play. As the official partner of Audi Sports R8 LMS Cup, with the Audi R8, the Honor Play combines sleek design and blistering performance. Both Audi R8 and Honor Play deliver speed that surpass the limits of the imagination.